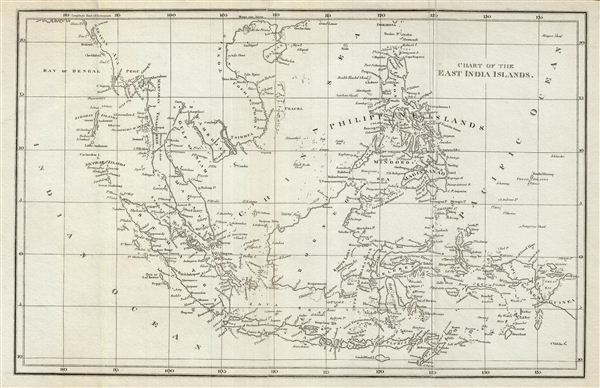 This is a fine example of the 1804 A. Arrowsmith map of the east Indies. Covers from the southern tip of Taiwan (Formosa) to the Indonesian island of Timor and from the Andaman and Nicobar Islands in the Indian Ocean as far east as Papua New Guinea. Includes Sumatra, Java, Floris & Timor & the Philippine Islands, Borneo, Celebes, Papua & part of New Guinea. Identifies the strait of Singapore and the Bintang Islands, but not the Island of Singapore. Throughout, the map identifies various cities, islands, bays, and an assortment of additional topographical details. This map is created by Aaron Arrowsmith in 1804 for his General Atlas. Arrowsmith, A., General Atlas, (London) 1804.